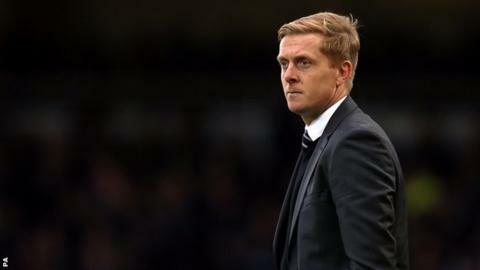 The Swans recruited four players last month and Monk has not ruled out further signings before the window closes at 23:00 GMT on Monday. Monk is not anticipating a busy day and said transfers are now in chairman Huw Jenkins' hands. Swansea have been among the busiest clubs during the window, recruiting Jack Cork,Kyle Naughton and Matt Grimes, plus taking Nelson Oliveira on loan from Benfica. "We've tried to identify the right ones and affordable ones and we'll go from there," Monk said. "I've spoken to the chairman and I've told him the targets that I want and to push for. Whether those deals get done, that's out of my hands. "If we can add that extra quality to help the players we already have here, then great. If not I go with the squad I have." Striker Wilfried Bony has been the most notable departure, joining Premier League champions Manchester City for a fee that could rise to £28m. French striker Bafetimbi Gomis and Wales left-back Neil Taylor have attracted interest but Monk has said he wants both players to stay at the Liberty Stadium. Gomis had criticised Swansea on French television, claiming the Welsh club had not fulfilled promises on playing time. But the 29-year-old is now first-choice striker after the sale of Bony and Monk says the former Lyon and St Etienne player is an important part of his plans. "Bafe I bought in to play. He's a Premier League player and he'll be a top player for us and I'm looking forward to working with him," Monk said. Swansea beat Southampton 1-0 on Sunday, with Jonjo Shelvey's brilliant late strike earning the Welsh club their first win away to the Saints for 62 years. Next up for Monk's side is a home Premier League game with Sunderland on Saturday.